According to Charles Darwin in "The Variation Of Animals And Plants Under Domestication" (1860s), "Azara states, but only on the authority of the inhabitants, that in Paraguay the cat has crossed with two native species." Geoffroy's Cat (F. geoffroyii) females will mate with domestic tomcats. In early experiments male Geoffroy's cats killed all domestic females presented to them. Halle Zoo attempted to cross-breed their male Geoffroy's cat with domestic females, but the male attacked and killed all the females that were introduced into its cage. Modern breeders of hybrids say this is avoided if the male is raised with domestic cats and imprints upon them. Geoffroy's hybrids are called "Safari Cats" and are reportedly tame and fertile. Infertility is a problem with the F1 hybrids which are reported to be large, intelligent and have gentle temperaments. The gestation period of the Geoffroy's cat is 75 days, whereas a domestic cat gestation period is 65 days. This is a major contributing factor to the problems breeding F1 Safari cats. The F1 Safari is therefore usually born premature by Geoffroy's cat standards and may require hand-rearing. Although Safari kittens can be nursed by a domestic mother, their growth rate and size (larger than either parent) means she may be unable to supply enough milk for and they will still require supplemental feeding. F2 Safaris are rare and difficult to produce. A factor influencing their fertility of hybrids is the chromosome complement (karyotype). Geoffroy's cat has 36 chromosomes. The domestic cat has 38. The F1 hybrid offspring of the Geoffroy's Cat and a domestic cat have 37 chromosomes - 18 from the Geoffroy's cat parent and 19 from the domestic cat parent. One could reasonably expect these offspring to be infertile. Some of the second generation F2 hybrids (i.e. F1 hybrid is back-crossed to the parent species, usually to the domestic cat to create a domestic-type temperament) also have 37 chromosomes while others have a count of 38. This is apparently because the F1 hybrids are heterozygous, and can produces eggs or sperm containing either 19 chromosomes or 18 chromosomes. F1 hybrids tend to be large while F2 and later generations are the same size as domestic cats. By testing for chromosome count, it is theoretically possible to select and breed hybrid cats which consistently have 38 chromosomes (like the wild ancestor) to maintain the size and appearance of the initial hybrid. 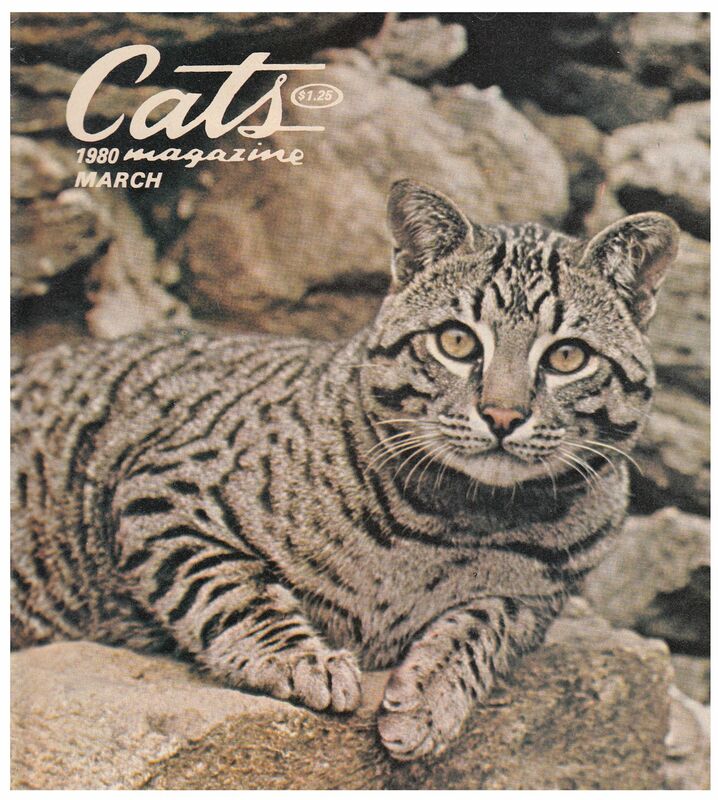 In the Long Island ocelot Club newsletter 23/2 April 1979, Pat Warren wrote that hybrid cats had been around for decades though little general information had been written about them. Some were accideental breedings where both exotic (small wild species) and domestic cats lived together. Others were planned. In her article she described two beautiful hybrid kittens with jet-black markings and spots on a ground of silver ticking. Their sire was the Payton's Geoffroy's Cat "Greg" and their mother was a black American shorthair named "Serrina". The Paytons were keeping one kitten, Jasper, but the other little girl, Leopard Lily, was bought by Warren. "At 1.5 years, she has grown into a magnificent animal. She weighs 15 pounds - more than either of her parents. ... In type, she strongly resembles a Geoffroy cat, though she has the deep, plushy resilient American shorthair coat instead of the bristly Geoffroy coat ... Like all hybrids [at least all known in Warren's time], she wears the exact markings of her exotic sire. She has the bar under the chin, the ocelli on her ears, the elegant lines down her neck and back, the round dots on her sides and belly - even the tiny dots on her toes." Being a hybrid, Lily had many of the little behavioral ways of exotics. Her tail language and body language were pure Geoffroy's Cat and she had the Geoffroy's complaining little voice and its deep loud purr. At the same time, she lacked the wild cat's wariness and instant nerve-ends and she boldly made friends with anyone who walked in the house. The Warrens were curious to know how Lily would react at a cat show. The judges and exhibitors were smitten by Lily's good behaviour and gentleness. The Warren's second Geoffroy's Cat hybrid was Gaucho, bred by the Jusseames from their Geoffroy's Cat "Shamus" and a sealpoint Siamese named "Sheba". Gaucho was acquired at 9 weeks old and had the habit of sucking earlobes. At nine months, he weighed around 17 pounds and was still growing. "Because of his Siamese ancestry, Gaucho has less of the Geoffroy type than Lily, but his markings are more striking than Lily's. His ground color is a bright silver and the markings are very crisp. Some of his spots cluster in rosettes. On his ears the ocelli are bright and round." While Lily [Geoffroy's hybrid] and Tonga [Bengal] were athletes, Gaucho was clumsy and not very bright, but had a very sweet temperament. Warren described him as a gentle giant. Like Lily, Gaucho was exhibited at some cat shows where people found it hard to believe he was a "wildcat". In the show hall Gaucho revelled in the limelight and sucked on the judges' earlobes. Long Island Ocelot Club Newsletter May/June 1990: Ethel Hauser announced a litter of 8 Safari kittens (Geoffroy's Cat hybrids) of which 6 survived. The kittens were mixed with some having distinct spots and others having a swirled pattern. In March 1980, Cats Magazine printed an article by Patricia Nell Warren (photos by Alice Su and Reg Riedel) entitled “Safari – A New and Controversial Breed.” This is a synopsis of that article. In 1980, the Safari was the newest cat to be presented to the cat fancy. It was also a controversial breed that had only been around for about four years. There were only about two dozen Safaris in existence, mostly in the USA, although the article claimed that some were also being bred in Europe. They had been exhibited at CFA shows along the East Coast of the USA, and several Safari exhibitions were planned for CFA shows farther west. Some had also been exhibited at CFF shows. Most of those appearances had been solicited by the show managers. Big shows found that Safaris attracted people into the show. Safaris had also appeared on TV talk shows and in major metropolitan newspapers. In Maine, show manager Phil Marriner invited a Safari six months in advance of his Downeast Cat Club show (CFF). The Safari received a full-page article in the Maine Sunday Telegram, and drew hundreds of local people to the show hall in Portland. By March 1980, about 31 CFA judges and 8 CFF judges had handled the cats, primarily to learn more about them, and some judges admitted to being nervous about handling the hybrid breed. The Safari had a fast-growing CFA-affiliated breed club called “Walk on the Wild Side Cat Fanciers,” and the waiting list for kittens was long. Though the Safari was not then registered in any association, it already had a small but vociferous group of opponents because it was bred from crosses between domestic cats and the small spotted South American wildcat called the Geoffroy's cat. The Geoffroy's cat belongs to the genus Leopardus, along with the Oncilla, Margay and Ocelot. Leopardus cats have 36 chromosomes, while the domestic cat has 38 chromosomes. The Geoffroy's cat was not listed as an endangered species, and there were at least 500 of them in captivity in the USA, both in zoos and as exotic pets. They bred quite easily in captivity, some being 4 generations away from their wild-caught ancestors. Cat fanciers called it a "feral-domestic hybrid" which was a misnomer because feral cats are domestic cats gone wild, and the Safari was wild-domestic hybrid. Feral-domestic hybrids were not new, either in captivity or in the wild. The Bengal already existed and domestic cats readily interbred with F lybica/F silvestis subspecies resulting in domestic cats heavily influenced by wildcat genes. Cat-population authority, Neil B. Todd, believed that such "introgression" might even occur in rural South America between European cats imported by ranchers and native wildcats. He said that occasionally a small cat, identified as a Geoffroy turned out to be a possible hybrid. People were extremely interested in the Safari because they were the only hybrids that could be well-mannered enough to function in the show hall, and be handled by the judge. This meant it had a potential future as a fancy breed. The article mentioned that both males and female feline hybrids could be fertile, but that fertility was higher in females. As it turned out, male feline hybrids are sterile for 3-4 generations, and the Safari was particular difficult to breed beyond the F2 generation because of the chromosome count mismatch. The breed's name had a curious history. Warren had suggested the name Criollo, a South American word meaning half- bred. But cat fanciers had difficulty pronouncing it. The next suggestion was Appaloosa, which suggested spots, but this was too strongly associate with a horse breed. The name “Safari,” though an African term, means a journey into the wild, but accompanied by some home comforts. The Safari was shorthaired with exactly the same pattern as their Geoffroy's ancestor: a distinctive spotted-tabby pattern of bars, dots, rosettes, wavy stripes, leg bracelets and tail rings as well as the white ocelli on the back of the ears. They were long-bodied and robust, but supple, with a slight arch to the back, and a long high-set tail. The head was massive, but streamlined, with small rounded ears that flowed into the neck line. A number of domestic breeds were used for crossing. The best marked hybrids came from Siamese or American Shorthairs crossed with the Geoffroy cat. As a result, Safaris were bred in a variety of colours. Geoffroy x Sealpoint Siamese produced black or dark-brown spots, on a ground colour that ranged from silver to golden. Geoffroy x Tortie American SH produced black-spotted, red-spotted (extremely striking!) and tortie-spotted hybrids. The article reiterated the information in the LIOC newsletter. The first hybrid female to produce offspring was black-spotted Leopard Lily, who had just had her second litter and was reportedly a terrific mother. There were only two F1 males, Gaucho and Poolee, and though they mated they did not sire any offspring. Breeders still hoped that some Safari males would prove fertile, but admitted that even if all F1 males were sterile, the females could be used to build a viable breed. Careful back-crossing and selecting would be needed to retain the Geoffroy's type and produce kittens with the South American head shape, arched back, deep flank and high-set tail. The appearance of fertile hybrids between domestic cats and cats of the Leopardus genus caused a mild sensation among scientists who interested in mammalian genetics. The Walk on the Wild Side club was invited to present a paper on the Safari at the Second International Conference on Cat Genetics and Population Ecology, held in January 1980 in Jamaica. A chromosome study of the Safaris was started by Drs. O. J. and Dorothy Miller, of Columbia University. They were studying mammalian hybrids, and were especially interested in hybrid cats because of the varied chromosomal complements. The F1 cats had 37 chromosomes, 18 from the Geoffroy's parent and 19 from the domestic parent. An F2 hybrid – one of Leopard Lily’s offspring – also had a count of 37, but because the F1 hybrid could contribute an egg with 19 chromosomes it was possible that some F2s might have 38 chromosomes like the domestic cat. While in Boston to exhibit Gaucho at the 1980 “Cats Plain & Fancy Show,” Warren met with several associates (Neil and Rachel Todd, and Ben Blumenthal) of the Carnivore Genetics Research Center which was accepted by CFA as its official "genetics committee." They felt that it would be possible to produce a 38-chormosome cat that was a phenocopy (visiually identical) to the F1 hybrid, but that would take a number of generations. The F1 Safaris were large: 10-13 lbs for females; 15-20 lbs for males. The F2 cats were the same size as domestic cats, but Once the Safari got beyond the F4 stage, large size could be reintroduced using large domestic breeds. Safaris were well-behaved at shows, but there was a perception that all hybrids were problem pets with poor temperaments and poor toilet habits. This was based on a 1974 CATS article by Dr. Willard Centerwall that gave a warts and all report on early Bengal hybrids. However, scientists like Pat Quillen found big hereditary differences in disposition among leopard cats (the Bengal’swild parent) and at her California institute she selectively bred leopard cats for a mellow disposition. CFA show rules allowed feral-domestic hybrids to be exhibited only if there was pre-notice to exhibitors in a show's flyer, and the hybrids are benched outside the show hall. Traditionally, in CFA, new breeds were presented at the October board meeting. So, in October 1979, the board took its first official look at the Safari. They viewed two Safaris. Acceptance was opposed by some Midwest people who wanted the Safari banned from the CFA shows altogether. The board decided to refer the matter to the CFA annual meeting in June 1980, for delegate voting. All 7 Geoffroy's cats used in the Safari breeding program had been are bred in captivity. This was the breed club’s policy. The darkest threat to the Geoffroy's cat was the fur business. One Geoffroy’s cat coat used far more cats than would be used in the entire Safari breeding programme. The Geoffroy's Cats bred in the USA and mated to domestic cats were still available for breeding to Geoffroy’s Cat females. Their willingness to mate with domestic cats did not spoil their willingness to mate with their own species. The anti-Safari group insisted that there would be hordes of amateur fanciers stampeding to buy Geoffrey's cats. This was not happening in actuality. 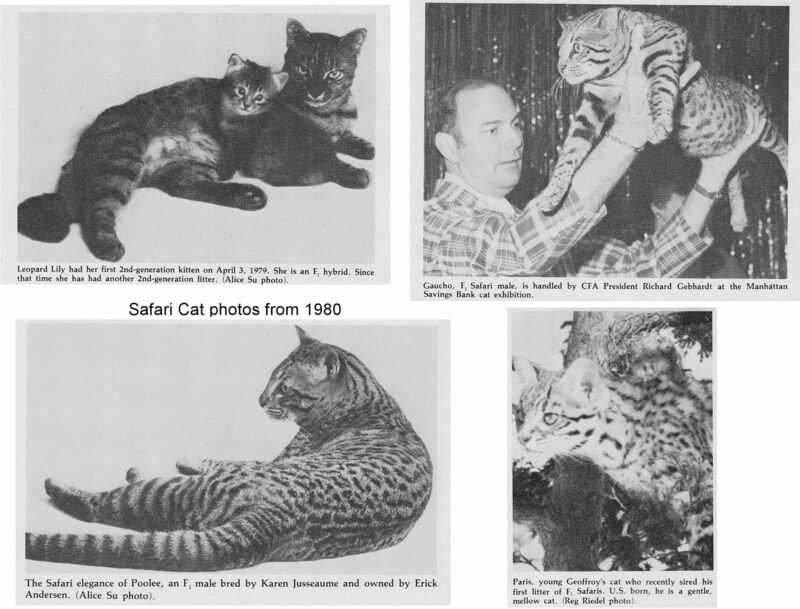 At the time of the article in March 1980, all 8 Safari breeders were members of the Long Island Ocelot Club, and were responsible and experienced in dealing with wild animals and had the necessary permits. Domestic-cat fanciers wanting Safari kittens all wanted F2 hybrid kittens, and the club wanted it to stay that way. It also felt that F1 Safaris should be registered with proof of domestic-born status for the Geoffroy's parent in order to ensure that imported wildcats would not be used in breeding Safaris. Pat Warren described Safaris as boisterous and rambunctious in a doggy kind of way. They love to race, romp, and climb and needed plenty of room in which to burn off energy and play, making them unsuited to a caged environment. They were very intelligent and could mastermind mischief that most domestic cats wouldn't dream of. The Safari could be intensely affectionate and attention-seeking. They tended to bond with one person, but could still be friendly towards other people. They ate normal cat food, but liked more greens in their diet than domestic cats, and used litter trays. The only special requirement (for F1 and F2 kittens at least) was additional calcium in the diet. In 1981, Phyllis Lauder wrote of an article about the hybrid Safari cat that had been published in Cats Magazine in March, 1980: The article and accompanying picture described the Safari as a cross between a domestic shorthair and a South American feral cat known as Geoffroy's cat, and belonging to the genus Leopardus. (The term feral was used wrongly; the author meant "wild species"). Lauder wrote "To judge from the pictures, one of them in full colour, and the descriptions given by the writer, Patricia Hall Warren, the Safari strongly resembles the Spotted cat who is one of the domestic shorthair Tabbies. This cross-bred cat has a great deal of patterning which includes many clear, distinct spots, and Mrs Warren describes the Safaris as '... Shorthairs. They wear a rich and specialised Spotted Tabby pattern of bars, dots, rosettes, face streaks, wavy stripes, leg bracelets and tail rings'. In her description of the type of these cats Mrs Warren tells us that they have long bodies, but she also says that they are robust and that they have small ears. It appears that the Safaris have been crossed successfully with Siamese and also with North American shorthairs. It seems likely that the cross with a Spotted Tabby shorthair could produce beautiful kittens. And it is interesting to note that the progeny are fertile. The writer says that people believe that a hybrid must be infertile, but that this is not the case with feline hybrids." The Safari cat hybrid was used in medical research. They were used for leukaemia research at Washington State University. In 1994-5, 6 Safari cats were used to study the behavior of blood forming stem cells in large animals. It appears these cats were irradiated as the research caused the Safari cats to become pancytopaenic i.e. there was a pronounced reduction of white blood cells, platelets and red cells in their blood; something normally caused by radiation, chemotherapy or disease. The cats were then "sacrificed" - the experimenters' roundabout way of saying the cats were killed by, or after, the experiment. The Asian Fishing cat (F viverrina) is an Asian species with a notable love of water. It is a muscular, medium-sized wild cat with adaptations (such as partially webbed feet and dense water-resistant fur) for living in marshy regions. It has brown fur with dark irregular spots and a paler-coloured belly. Experimental hybrids called the Machbagral, or Bagral, have been bred in the USA/Canada, using the Fishing cat and a genetically spotted melanistic domestic cats i.e. black cats with the gene for spotted tabby and showing a shadowy spotted pattern. The aim was to create an exotic-looking cat that combined the domestic temperament with the appearance of a small black panther with a shadowy spotted pattern visible in certain light. The aim was to create a black panther-like breed rather than a domestic cat resembling the Fishing Cat. The breed encountered problems of low fertility in the F1 hybrids and does not appear to have progressed since initial reports. 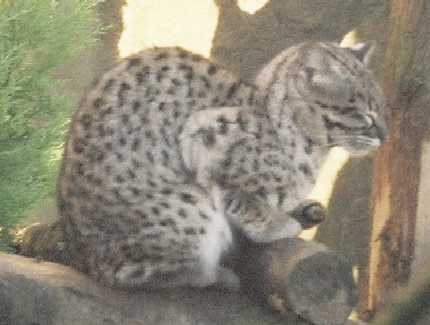 The early hybrids resembled the Fishing Cat and were large, very rounded and had thick, dense fur. They had a silveryto charcoal-blackish background colour with black spotting and markings similar to the wild parent. The F1 hybrids were claimed to be very friendly and to use the litter tray like a domestic cat, but they had voracious appetites! They were also intelligent, active and inherited the wild parent's attraction to water. 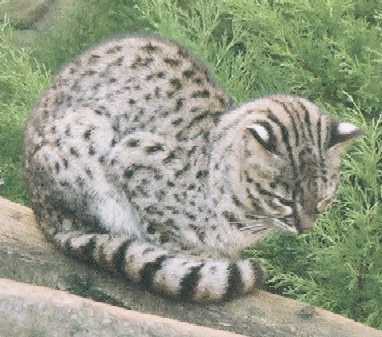 Another Fishing cat hybrid was the Viverral, first bred in 1995, but not considered genetically stable until 2001 when fifth generation Viverrals were born. This suggests it progressed beyond the F1 generation. Fishing Cats were bred to early generation Bengals (i.e. with a relatively high percentage of wild genes). They resemble the Fishing Cat, but have a domestic temperament. Viverrals are large, very muscular and solid. The Viverral breed standard requires an agile and very muscular cat with a spotted coat. They have a wide nose, prominent whisker pads and large round eyes in a smallish head. The face has a slightly convex profile and short rounded ears with wide bases. The tail is thick, low-set and medium in length. The coat is described as short and plush with a randomly spotted pattern of black, brown or tan spots. There should be dramatic contrast between the base color of the coat and the spots. The underbelly should be pale cream or white and also spotted. There are white spectacles around the eyes. In recent years, there has been no news of the Viverral. The third Fishing Cat hybrid is called the Jambi and appears to recreate the Viverral in that it also aims to produce a large, muscular spotted domestic breed resembling the wild Fishing Cat. Again, this appears to be at the F1 generation and the fertility of hybrids hasn't been stated.